Knock knock! 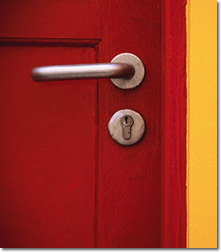 Did you know that, these days, the front door of your business is very often not a door at all? It's a website. Your potential customers are Web pedestrians entering your shop online before even thinking of opening a phone book or driving to your location, if you have a location at all. Having a website enables you to reach the biggest audience you can possibly reach, and the best part: your business can be open 24/7! Don't worry, you don't have to sit at your computer constantly, but we're ready 24/7 to support you and make sure your website is running properly and reaching your customers. With our team's background in graphic design, marketing, and development, we'll identify your target audience and make sure you look your best for them. Web hosting, support, and maintenance. So, is your front door welcoming your customers in, or scaring them away? Do you have a front door at all? If you don't have a website yet, there's no need to panic. It's not too late! That's what we're here for. Having a website that doesn't align with your branding strategy can be just as detrimental as not having one at all, but you can breathe easy knowing we have the "techspertise" and marketing know-how to make sure that your website represents you. Don't let your site grow stale! Click here to learn how you can keep your site fresh and up-to-date.